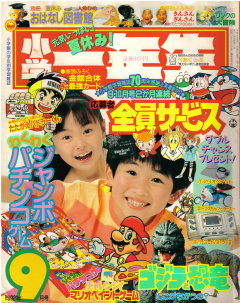 The September 1992 issue of Shogaku Ichinensei (小学一年生) contains a variety of comics, including a Sonic the Hedgehog story by Mitsuo Kimura, starting on page 96. The magazine's contents page lists Sonic the Hedgehog as a new series, however the previous four issues also contained Sonic the Hedgehog content. It is currently unclear what the distinction is between Shogaku Ichinensei's earlier Sonic content and the Sonic comics from this issue onward. This page was last edited on 18 September 2018, at 19:01.